We use sophisticated computer simulation methods to understand the physical origins of biological behavior. Much of our work has focused on membranes and the proteins and peptides that interact with them, but more recently we’ve branched out to work on other topics, including peptide aggregation. The primary goals of simulation are to interpret existing experiments and suggest new ones. Toward this end, we collaborate with a number of experimental groups. Rhodopsin is the mammalian dim-light receptor, and the best characterized member of the G protein-coupled receptor (GPCR) family of membrane proteins. We have worked on multiple aspects of rhodopsin function, including the role of lipid-protein interactions in modulating rhodopsin function, the properties of water inside the protein during activation, and the overall mechanism of rhodopsin activation. More recently, we’ve been working to model the picosecond-timescale dynamics immediately following photon absorption. This is a collaboration with experimentalists from the University of Arizona (Michael Brown’s lab), Arizona State (Petra Fromme, Rick Kirian, Abhishek Singharoy), and Hauptmann-Woodward (Tom Grant). Using X-ray free-electron lasers, we measure time-resolved small-angle and wide-angle X-ray scattering (SAXS and WAXS) for rhodopsin in detergent micelles. Comparing dark state rhodopsin with activated protein in a pump-probe experiment reveals the perturbations due to photon absorption. We use classical simulations in a similar format to elucidate the atomic-level motions leading to the measured signals. We have an ongoing interest in the ways peripherally bound molecules alter membrane structure for functional purposes. To this end, we’ve studied the effects of antimicrobial lipopeptides. As the name implies, these are small peptides conjugated to fatty acids, which bind to outer membranes of bacteria or fungi and kill them or inhibit their growth. Shai lipopeptides are 4 amino acid peptides N-terminally conjugated to a 16-carbon saturated fatty acid, initially synthesized and characterized by Yechiel Shai’s group at the Weizmann Institute. We used all-atom and coarse-grained modeling to demonstrate that the acyl chain accounts for essentially all of membrane affinity of the lipopeptides, while the peptide portion determines ability to selectively target anionic lipid compositions representative of bacterial membranes. More recently, we used large-scale free energy calculations to show that aggregation of the lipopeptides in solution induces kinetic selectivity; lipopeptide micelles bind to anionic membranes efficiently, but experience a larg e free energy barrier when approaching neutral membranes. Fengycins are a family of bacterially synthesized cyclic lipopeptides that are active against fungi. 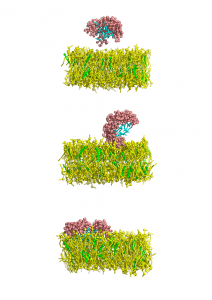 Our initial coarse-grained and all-atom simulations suggest that fengycin aggregation once bound to the membrane may play a role in the peptide’s activity. We are currently using novel enhanced sampling methods built around the weighted ensemble algorithm to determine the thermodynamics of lipopeptide binding and aggregation as a function of membrane composition, particularly the presence of cholesterol. Alpha synuclein is the primary protein found in the plaques found in the nerve cells of patients with Parkinson’s disease and Lewy Body Dementia. It is unstructured in solution as a monomer, but forms small oligomeric aggregates at higher concentrations, before eventually transitioning to form protofibrils and fibrils. The oligomeric structures, which are not well-understood structurally, are believed to be the primary toxic species. Recently, several structures have been released for alpha synuclein (both fragments and the full-length protein) in protofibrils and fibrillar states. In collaboration with the lab of Jonathan Sachs at the University of Minnesota, we are working to leverage these new structures to understand the physical origins of aggregation and fibril formation. Understanding the key steps controlling the thermodynamics and kinetics of the mechanism will suggest residues and motifs that could be targeted therapeutically. We are collaborating with Dr. Andrea Markelz (State University of New York at Buffalo) to develop physical interpretations of new experiments involving terahertz-frequency spectroscopy of protein crystals.